My mom and I attended a sushi-making class through Santa Barbara City College’s School of Extended Learning last week. The instructor was informative and entertaining, and a professional sushi chef was there to share his well-honed skills. It was fun to try something new, and, of course, we got to enjoy our delicious handiwork. Another plus: The class was at the Schott Center, close to home for me and convenient to downtown. As we were leaving, we saw a sign pointing toward an open house, so we decided to go take a look. From the street, the property for sale at 515 West Los Olivos Street appears to be a modest one-story house. And, well, what you can see from the street is exactly that. The front door opens into a wood-paneled living room, with the kitchen, bathroom, and two bedrooms laid out behind it. I visit a lot of open houses, and most of them are professionally staged. Designer furnishings and flourishes give houses for sale a clean, stylish look. Even homes that aren’t staged are usually manicured and decluttered. This house, however, is full of furniture and knickknacks. It is very obviously being lived in, and it wasn’t dolled up to impress us. We soon learned that the main attraction of this listing is not the house itself. We walked out the back door, past a patio and a huge old oak tree, and saw that the backyard is huge. There’s a free-standing shed and an open yard beyond. The yard is fenced, but you can see the neighboring houses. On one side sits a similar single-family home, and on the other is a set of two-story condominiums. 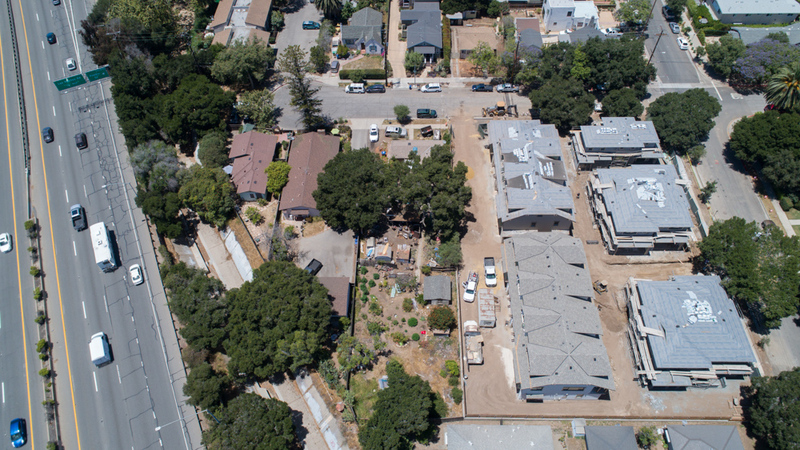 This handsome condo complex is Westmont College’s newly constructed staff and faculty housing, which has been lauded as a positive example of a local organization trying to help its employees secure housing. 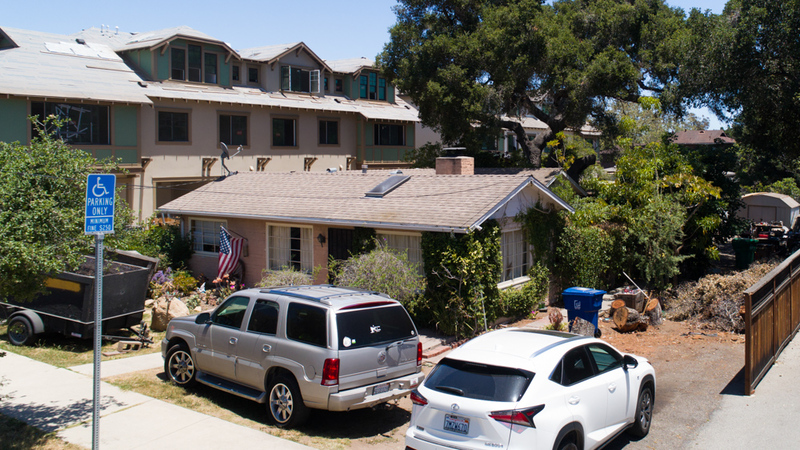 The 13-unit development is also an example of the level of density allowed by the City of Santa Barbara’s Average Unit-size Density (AUD) program. And therein lies the primary appeal of the property for sale at 515 West Los Olivos Street. While the house is relatively unexceptional, the size of the lot is over 12,600 square feet. This property is zoned R-3, and it is located in an area designated as medium-high density, which means that up to seven units could be added. This potential for development, plus its location near Cottage Hospital, is the true benefit of this property. Mom and I drove away, comparing notes about the house. She liked the fireplace in the living room. I liked the staghorn ferns growing on the trunk of the oak tree, and the little succulent garden in the front yard. We agreed that the house wasn’t what we had expected to find when we followed the open house sign. But then, this wasn’t a usual Saturday for us. 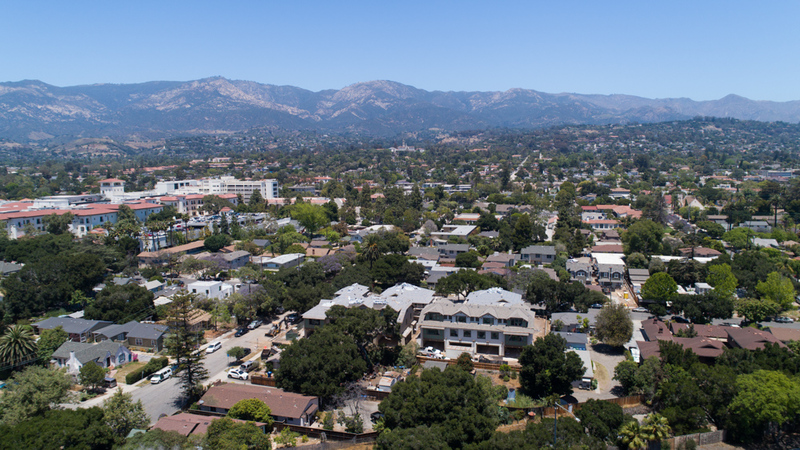 515 West Los Olivos Street is currently for sale in Santa Barbara, listed by Kristin Arntz of Berkshire Hathaway HomeServices California Properties. Reach Kristin at 636-6867 or kristin@kristinarntzhomes.com.